In Part 4 of the Progress Bar series, we integrate a progress bar control in a GUI application that submits a job for background processing. We also demonstrate how to interrupt the running job. In this scenario, we show the use of the progress bar while processing a background job. This application is an example of a “responsive” form which prevents the form from freezing during job execution. The form also provides an option to interrupt the job at any time and includes a time-lapse display. In the “Start Job” button control script block, we add the code to initialize the progress bar properties after a folder is selected. After selecting a folder containing PDF files, we get the total number of files and use that in the Progress Bar Maximum property. Then we initialized both Step and Value properties to 1. Name – The Job-Name for the running job. ArgumentList – (Optional) A single value or an array of values to pass as an Argument to the job. 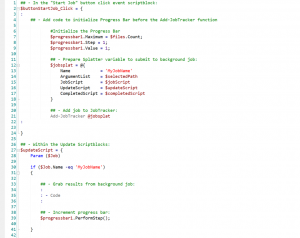 JobScript – The script code that will be sent to run the background job. 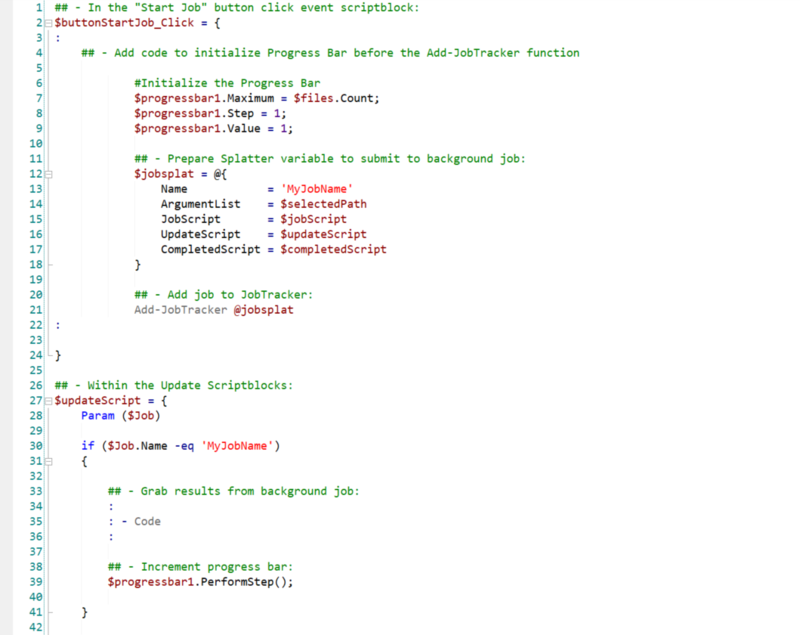 UpdateScript – The script code used to update what is going on with the background job. CompletedScript – The script code that will execute when the background job completes processing. At this point, the function will submit the job for processing in the background. While the job is processing in the background, the PDF files in the selected folder are being displayed in the output “RichTextBox” control, the timer is counting, and the progress bar increments while processing. In this section, the progress bar method PerformStep() will trigger the bar to increment. 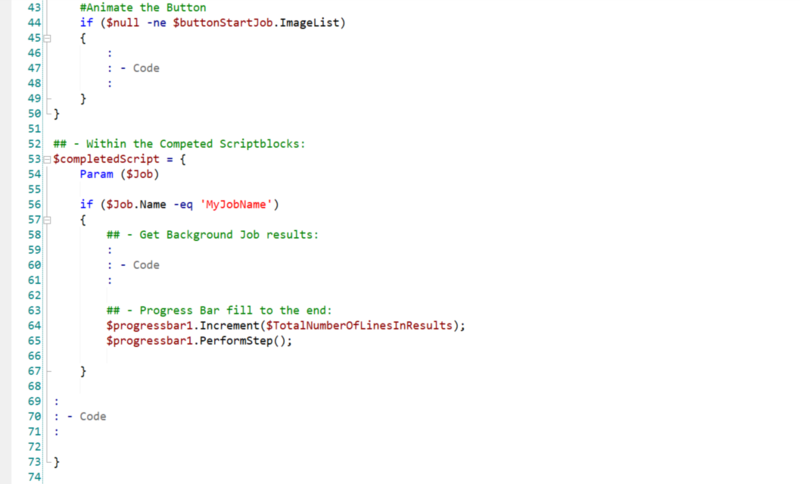 When the background job ends, the “CompletedScript” script block section executes. 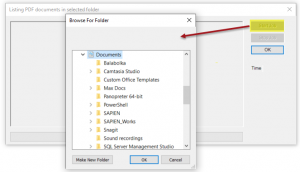 At this point, the total number of PDF files found will display in the “RichTextBox” output area, the total duration of the process will be displayed, and the progress bar will increment to completion. 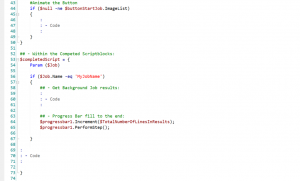 In this section, we use the progress bar method PerformStep() to help complete the bar. This application includes the ability to stop the job with the “Stop Job” button control. When the job is stopped, the progress bar will stay idle without any increments. As you can see, it was simple to integrate the progress bar properties in the Add-Tracker function script block with the button controls. We have shown how to integrate the progress bar in a “responsive” application that is handling a background job, with the ability to interrupt the job. Next in the series is “Part 5 – Display Progress in a Script (non-GUI) solution”, where will be using the “Write-Progress” cmdlet.